Dallas County Community College District Chancellor Joe May addressed concerns about faculty workload, lab pay for professors and hiring Boston Consulting Group during livestreamed discussions March 28 and April 1. The initiatives, part of the student-centric transformation, are being designed to help the DCCCD manage its growth and meet demands from the community, starting with addressing employee policies that May wants to take to the Board of Trustees. May said other non-policy initiatives, such as the DCCCD master plan to renovate campuses, also fall under the student-centric transformation. May and the Boston Consulting Group’s J. Puckett responded to questions and comments from previous campus events during the livestream. While these events were called town halls, Eastfield President Eddie Tealer said it was more of a “listening town hall” as the audience did not receive real-time responses. 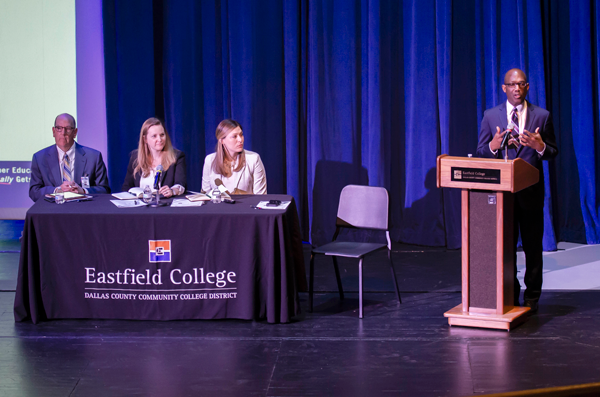 Extra-service contracts, eight-week class terms and the inclusion of the Boston Consulting Group in the transformation process were major points of concern for Eastfield employees at their March 22 town hall. History professor Matt Hinckley expressed concerns about the possibility of reducing or changing policies for extra-service contracts that could make it harder to staff certain classes. May said in the March 28 livestream that extra-service contract workload limits would not be changed despite recommendations for change from the Boston Consulting Group. “We’re in growth mode,” May said. Because of that, May said extra-service contract limits do not make sense and the district is looking into hiring more full-time faculty. Extra-service contracts allow employees of the district to take on teaching jobs outside their regular duties. “Without offsetting increases in base salaries, reducing extra-service teaching opportunities may hurt all of our high demand programs as well as hurt our ability to retain what diversity we do have in our faculty ranks,” Hinckley read from his prepared remarks. Lack of compensation adjustments to account for the experience of faculty could lead them to seek work outside the district, according to the 2017 Faculty Association climate survey. The same survey found that faculty rely on extra-service contracts over work outside the district to help fulfill their financial needs. May also wants to pay professors teaching labs the same per-credit-hour rate as those teaching lectures. That will help make increase equitability for faculty, he said. Release time, where faculty get time away from class to work on other projects, committees or duties, was another inequity found in the district. Not all campuses treated release time the same, and May said it will be important to create clearer guidelines and policies on how release time will work. Mutiple employees in the audience expressed frustrations with eight-week terms. Eight-week terms was not one of the topics intended to be discussed at the forum, but some employees expressed worry that the student-centric transformation may lead to other campuses embarking on eight-week initiatives. English professor Sabine Winter compared what it takes to learn in a class to advertising, one of the fields in which she teaches. English professor Kassi Buck said eight weeks can also cause problems in student engagement. The Rotaract Club at Eastfield, which she advises, has seen a drop in activity because students are feeling pressure from eight-week classes. May said in the April 1 livestream the data he has seen shows success in eight-week terms, but it doesn’t work in every case. He said it’s still been cited as one of the best practices on a national scale. Limiting the number of courses students take is important to their success, May said. Speech professor Nick Vera said he was concerned with the use of taxpayer dollars to pay for the Boston Consulting Group. The district is spending $1.5 million to hire the group, according to the contract approved by the Board of Trustees Dec. 4. “We seem like we have in-house consulting that could also help with this,” Vera said. DCCCD trustee Dorothy Zimmermann, an advocate for reduced spending, was also concerned with the price tag and said in the Dec. 4 meeting that she worried using an outside consulting group instead of in-house talent could change the culture of the DCCCD too much. Trustee Diana Flores said she supported the contract because the DCCCD needs better ranking among two-year institutions. Trustees Wesley Jameson and Monica Lira Bravo also supported the contract. The contract was approved 3-2, with Charletta Rogers Compton joining Zimmermann in voting no. Trustees JL Sonny Williams and Philip J. Ritter were not present for the vote. The Boston Consulting Group has worked with the district on other projects, including 2016 consulting on the Dallas Promise, Vice Chancellor Justin Lonon said. The Dallas Promise provides last-dollar financial aid for students from participating high schools at no cost to taxpayers. The Boston Consulting Group also has experience with other higher education work, including helping establish the first independent, nonprofit liberal arts university in Vietnam. May said during the livestream that he values the opinion of the Boston Consulting Group. Their local connection to Dallas, with an office based in the city, was another reason May said they are qualified to consult: They know the area and its needs. May touched on other subjects not approached by Eastfield employees during the event on campus. At the end of the March 28 livestream, May said he did not know yet what the term high-performing faculty means or how it will impact the district. This has been a hot topic among faculty that worry the DCCCD will begin pushing faculty for quantity over quality. The term “high-performing faculty” has caused tension at previous meetings between May and Eastfield faculty who are concerned that success rates will be the measurement of performance. It has led to worries that faculty will be encouraged to lower the rigor of their classes to push students through. May also said class sizes and faculty compensation for classes are an important topic he is reviewing. Professors teaching larger groups of students in a single class deserve to be compensated for their extra work while faculty that teach classes in smaller programs should not be penalized for their lower enrollment, he said. In some cases, these smaller classes are below the minimum enrollment but are necessary for students in certain fields of study to graduate. In many cases, professors who take on these classes get lower pay. “That’s putting an unfair burden on them [professors] in the process,” May said.